No one knows the impact driving while impaired causes more than those who have lost close family members to intoxicated drivers. In December 2015, Kalina Tsaneva was killed by a speeding drunk driver. 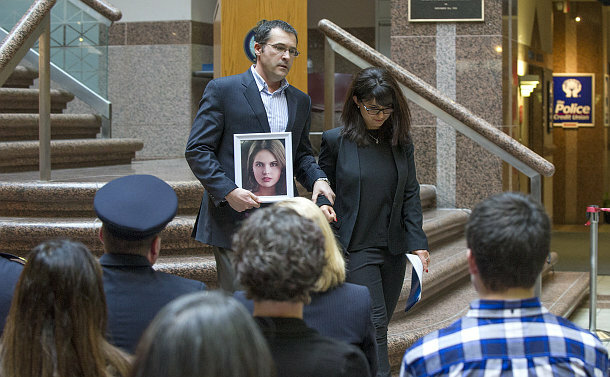 With husband Victor Tsaneva by her side, holding a picture of their late daughter, Valya Tsaneva shared the pain she and her family still endure after the devastating loss at the Mothers Against Drunk Driving (MADD) Toronto annual Project Red Ribbon launch at Toronto Police headquarters on November 7. Kalina Tsaneva completed her undergraduate degree in commerce with honours at the University of Ottawa and was in the first year of a Master’s program. She won business competitions, ran marathons, supported charities, worked as a teaching assistant at the University of Ottawa, pursued a musical career and developed a passion for sports, including basketball and swimming. Valya Tsaneva promised to fight until her last breath to change the public attitude towards impaired driving, eradicate misconceptions and improve laws. “My hope is that, one day, we will live in a world where acts of violence like impaired driving that kill and injure people and devastate families no longer exist,” she said. Deputy Chief Barb McLean said the Red Ribbon campaign carries a simple and powerful message. McLean said eight of the 51 fatalities in Toronto this year are due to impaired driving. During this campaign, Toronto Police will increase the number of R.I.D.E. sport checks. “Using intelligence-led enforcement, more officers will be out on our roads stopping as many vehicles as possible to check for those who might be impaired,” said McLean. Minister of Community Safety & Correctional Services Marie-France Lalonde said the Red Ribbon campaign is a reminder of the dangers of drunk driving. “Driving under the influence of alcohol takes lives, destroys families and leaves a lasting impact on survivors,” she added. 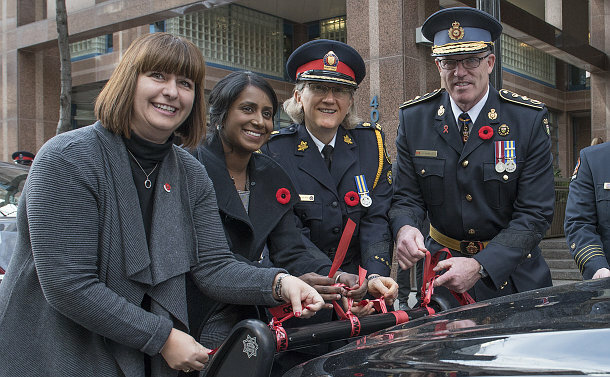 Eva Ratnakumar, the president of MADD Toronto, said her organization wants its red ribbons to be seen everywhere to remind people that it is never acceptable to drive impaired. “We need to drive home the message that impaired driving can be prevented if everyone makes good, responsible and safe choices,” she said. Three Toronto Police officers were the recipients of MADD Toronto Excellence in Police Service Awards. In April 2014, Constable Nicole McEachran – with the support of her unit commander Superintendent Ron Taverner – started Project BAC (Blood Alcohol Content). The program was launched with the 19-year law enforcement veteran spending her afternoon and night hfits driving around the 22 Division community looking for signs of impairment. “As police officers, we have a responsibility to ensure that the roads, which we also use, are safe,” she said. One officer from each of the Division’s five platoons is assigned to the program during the night shift. “That is the ideal time because when you stop vehicles between 10 p.m. and 3 a.m., the likelihood of people being impaired is quite high,” said McEachran, who has been at 22 Division since 2005. Constable Michael Thompson of Traffic Services is considered a subject matter expert on impaired driving. He instructs the Traffic generalist course which teaches frontline officers about current issues and best practices in dealing with impaired drivers. Constable Christopher Ramsbottom’s leadership and dedication to reducing impaired driving spans his entire 15-year career. In the last year, the 33 Division officer has been responsible for the arrest, prosecution and sentencing of 10 impaired drivers in his community. Now in its 29th year, the Red Ribbon project is Canada’s longest-running public-awareness campaign during seasonal celebrations that make impaired driving a heightened concern. The campaign runs from November 1 to the first Monday in the New Year.